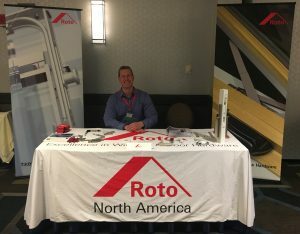 Roto North America was a Silver Sponsor at the WDMA Northeast Winter Conference held in Philadelphia on January 22 & 23, 2018. At this event Roto North America showcased the 9100 Patio Door Handle, Casement Corner Drive hardware, and OP06 and OP08 operators. Roto North America is comprised of Roto Frank of America, Inc. is Chester, Connecticut-based and Roto Fasco Canada, Inc. is Mississauga, Ontario, Canada-based. Both locations manufacture window and door hardware, which offers solutions for North American and European applications. RFA and RFC are wholly owned subsidiaries of Roto Frank AG, a global leader in window and door hardware, with 17 production plants and more than 40 subsidiaries worldwide.